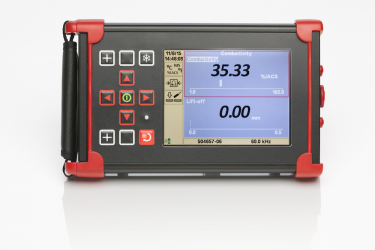 Designed specifically for Non Destructive Testing in the Aerospace industry, the AeroCheck offers NDT inspectors a lightweight, easy to use solution for NDT inspection. The single frequency AeroCheck2 has a frequency range of 10Hz to 20MHz, whereas the dual frequency AeroCheck+ offers 10Hz -12.8MHz, ensuring a diverse range of real world applications can be met. The AeroCheck series uses a wide range of eddy current probes meeting all the needs of the aerospace eddy current inspector. Weighing just 1.2kg (2.7lbs), housed in a tough aluminium alloy Mg Si 0.5 powder-coated outer case and fitted with rubber feet to aid grip, the AeroCheck is as stable on a wing of an aircraft as it is on a laboratory bench.